Clericless, the epic battle with the phantom knight Salazar Vladistone and his 4 templar knights was fought by Fargrim the dwarf slayer, Jarren the wizard, Quinn the knight and Erimikus the elf rogue. They advanced through burning Inverness to the hidden graveyard, and there found the phantom Salazar with his ghostly blade against the neck of the town sage Faldyra. She was on her knees before him as he cursed her and demanded to know why he couldnt commune with his dead and buried wife. After a bit of conversation, in which Salazar laughingly boasted that all he wanted was to visit the site of his wife’s grave, and that if Splintershield had allowe dhiom to pass, none of this would have happened. Oh well, he grinned, and I asked for an initiative roll. With relief, the four players reached for their 20 sideds. The dwarf went first, and he threw a hammer at the nearest phantom solider, a templar with a men looking morning star. The wizard sent off a round of arc lightning, and the thief began his stabbing dance. The enemy chose to begin with range, and other then the templar engaged with the rogue, the other two swung their morning stars until two ice-balls formed and streaked towards the wizard and the dwarf. They were struck and besides damage, were slowed by the petrifying cold. Salazar then shouldered his crossbow and fired at the dwarf, but missed. Quinn, who was late to the party showed up just in time to charge full bore into one of the templars, hammering him with his hands, and the weapons they held. One of the templars managed to chase the wizard back into a corner, and he was battered savagely before being knowkced to the ground right at Salazars feet as he charged into the fray. The phantom Vladistone then began a spinning attack the struck everyone nearby, including the unconscious wizard. On his turn, he miraculously leapt up awake, and was promptly felled a second time. By now Quinn was close enough to pour his last healing potion down Jarrens gullet, getting him back on his feet for the second time in the battle. He made good use of his third chance, and blasted a hole through Salazars chest with a magic missile, sending the ghost cackling back into the netherworld. “Fools! 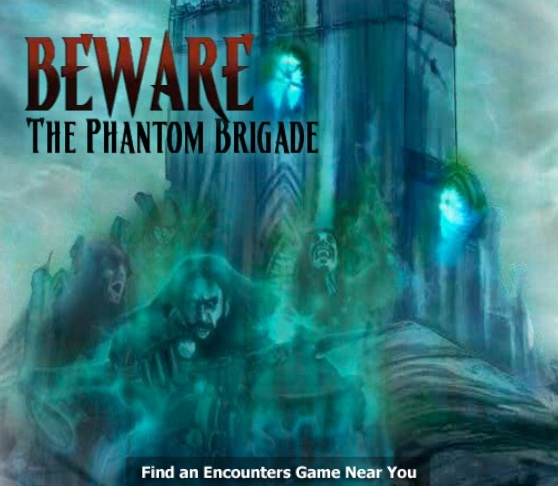 No mortal may slay a member of the Phantom brigade!” he shouted as he was apparently slain. Fargrim charged the last remaining templar, doing massive damage and bloodying the ghost, but when he tried to intimidate, he frightened himself rather than the phantom, and it took Erimkus and a knife in the back to send the last ghost on his way. With their enemy slain, Quinn bent to pick up the sword of Salazar Vladtistone, and it blazed in his hand as he hefted it. Session began with a bit of back-pedaling, to describe the last moments of the battle with Finn MacCool and his band of jocks, the Fialla. 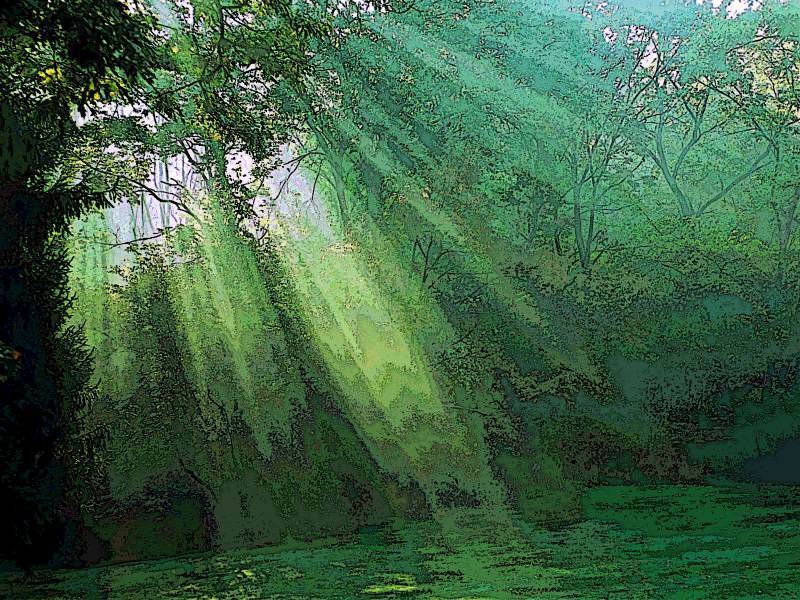 Amergin mocked them as the giant elves, living and dead, began to fade as the sun rose and the fey snows melted away to reveal the lush jungle greenery. Before dissappearing back into the fairy realm wince they ride forever along the circuit of the Wild Hunt, Amergin the bard said they fought well, and tossed them a bag of loot, the plunder of the last fools to cross the paths of Finn MacCool and his noble crew. He may also have flipped them the bird – he was known as Ghostraven after all. Beyond the rock-walled clearing the jungle closed in on all sides but to the north, where a small narrow field stretched towards the forests edge a hundred or more yards away. The tall trees overhung on all sides, and to them the party prepared to climb in order to ascertain their location, for they were lost – not even sure if they were still on the Isle of Dread – such is common among the survivors of a Wild Hunt. As Poppy prepared to climb a tree, she noticed something or someone watching her out of the corner of her eye. It was a creature about halfling sized, who was covered in fur and had a long prehensile tail. She also noticed it wore a necklace of bead and teeth. HOWEVER, just then Felipe stepped up to mention that there was no need to get wet, she had the psychic power of telekinesis, thanks to the burning radiation of Dark Sun, and could lift it out. Hex dipped a single finger-tip into the pool, and was surprised to see the tip of his finger turn to gold and drop down into the darkness of the bottomless pool. Poppy shouted to the creature from the fields edge. It seemed to startle easily on its perch, a fallen log at forests edge, and when they shouted, it retreated along the log on its sharp toes. As Ria prepared to walk towards it with her hands outspread in a peaceful manner, Felipe left Hex at the pool to come to her side, Felipe sidled up to her, and though she couldnt see anything, her whiskers twitched – she knew it was a trap. (It was.) 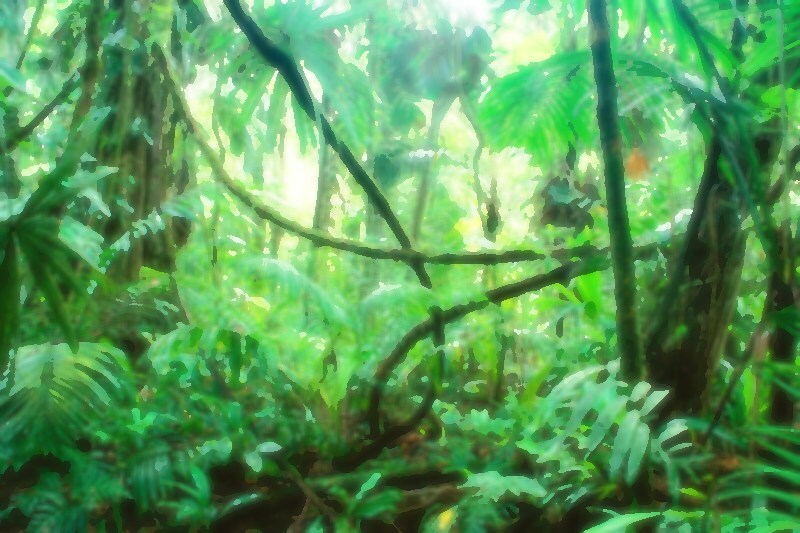 Eventually she found vines stretched across the jungle floor and some were tied into loops cunningly set. She left Ria to speak with the creature as she returned with Poppy to the well so their combined telekinetic strength could lift the heavy crown of solid gold. It did, and Hex was already gathering objects and tossing them nto the well. Each thin turned to gold and sank to the bottom, or broke off from whatever was partially submerged, just as his now bandaged finger-tip had. Ria called out in the deep booming tones of primordial in an effort to communicate. The creature replied “Chibi-chib-chibi… Fanaton!” and stood on his two legs, shaking his staff. She saw that he had skin stretched from wrist to ankle, like a flyin squirrel. The thought made her glance to the trees, and it seemed some of the leaves shook in response. Just then the golden crown was pulled blazing from the pool and the chibi fanaton screamed “Chibi-FANATON!” and the ambush of the Fanaton was revealed. From out of the trees five bolas flew – leather thongs with heavy stones on either end, meant to trip and tie up the opponent. Both Hex and Thokk were dropped by these primitive weapons, but the rest evaded. The fanaton who tried to lure them across the field aimed his staff into the midst of the heroes as they stood around the pool, and a globe o misty green flew forth to explode on the ground at their feet. Misty tendrils of vines wrapped up the heroes like thorny cocoons. Poppy, Hex, Felipe, and Ria were all restrained by the vines. Only Hex was able to teleport free, but the bola still had him knocked to the ground immobile. From that position he slashed at the fanaton druid. Hexes arcane pwoer allowed him to teleport his stricken foe a short distance with each strike, and he sent the chibi fanaton close to the golden well. Out of the trees, the five other opponents revealed themselves, swooping down on their wings in dive bomber fashion. 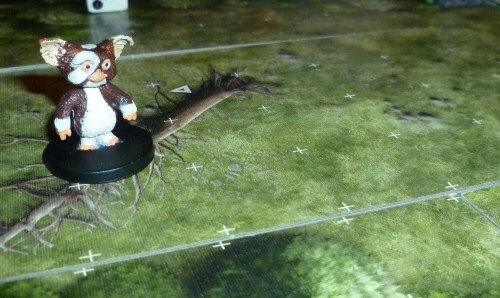 Halfling sized flying squirrels who grasped a pair of javelins in thei hands and feet. They stabbed with each of the javelins as they descended, Ria, Poppy, and Felipe were hit by the fanaton ambushers, who then either swooped back into the trees or landed to fight on foot with their javelins. It was at this point some one remarked that they were ill-prepared for a full assault. They were spread out, many of their powers expended from their wild night out, and these little creatures were not so cute and inoffensive as once thought. Earlier I had mentioned that some of the battles were not as challenging as I expected, and that maybe some players thought they were too easy, or that their characters were unkillable. That this encounter was an answer to that call added an edge of tension to the battle, and the big double punch of the fanatons opening move reinforced that idea. Hex soon sent the leader sliding towards the pools edge. Twice the fanaton was able to hold on without going in, but the third time he became a golden statue quickly sinking out of sight to the dark bottom. Sharia rushed forward to use her lay on hands healing, and stepped right into on of the snares. She was yanked upwards, but still fought, swinging her sword upside down against the fanaton we came to know as Top-hat. The battle had a sharp first act, culminating in many of the characters near their breaking point. The chibi fanaton would use their prehensile tails to trip their opponents and them stab into them with their poison tipped javelins. Eventually two more of the fanaton were sent to golden death, and the victory swung into the parties favor. As they last of the fanaton were being beaten down, the heroes began to speak of their new-found wealth, they had found the epicenter of their new empire in is small clearing in the jungle. 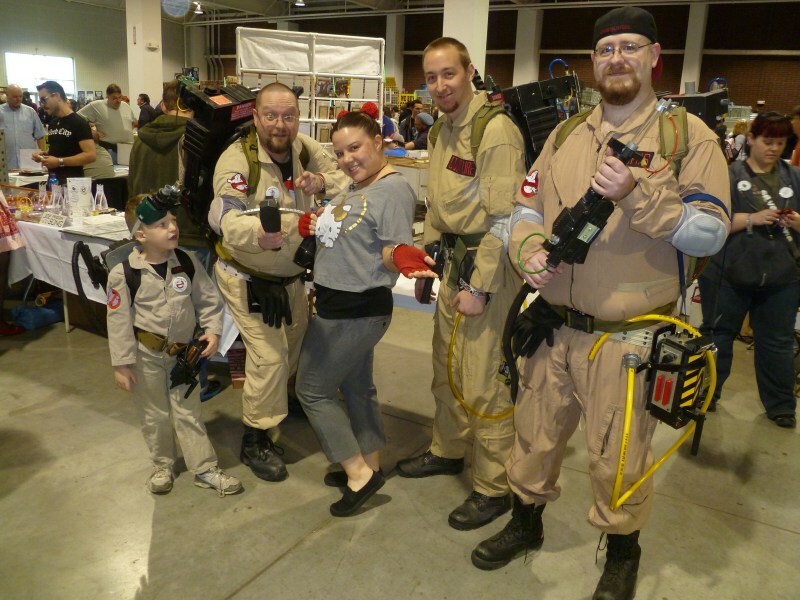 This Saturday saw some friends and fam gathered at the yearly Planet Comicon event for Kansas City. It was a great gathering of geekdom, and a big mixed up over-populated auditorium full of fandom, shopping, and gazing in wonder at all the amazing sights. 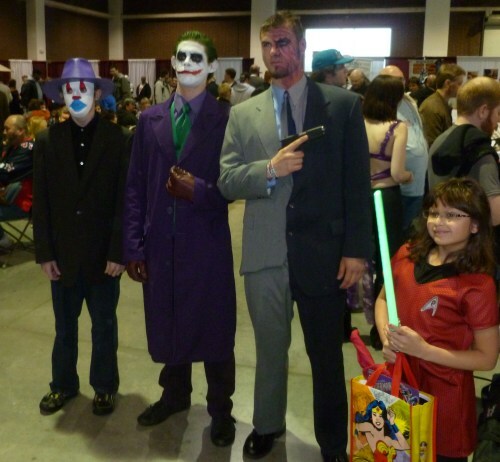 One of my favorite things about conventions are the costumes, and I vow to have one for the next convention, but for now we can look at some of the great costumed characters out and about. 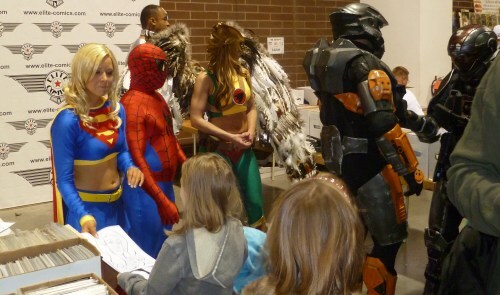 I was going to chat with Supergirl but her boyriend gave me the evil eye. Who you gonna call? Thats right, it looks like our cleric Ria (short for Maria Guadalajara) is willing to consort with just about anyone to turn the undead, even these fellas. They are looking pretty good. Here we have a trio of villains being held at bay by a young heroine ensign with her laser sword. That mook on the far left really looks pathetic. 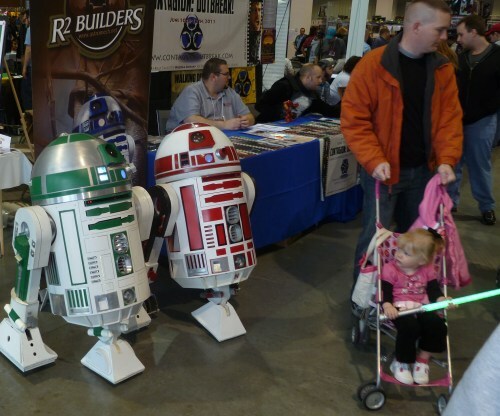 There were droids, and the small child watched them with concern. The laser sword she wields was a big hit and many were the duels fought this day. 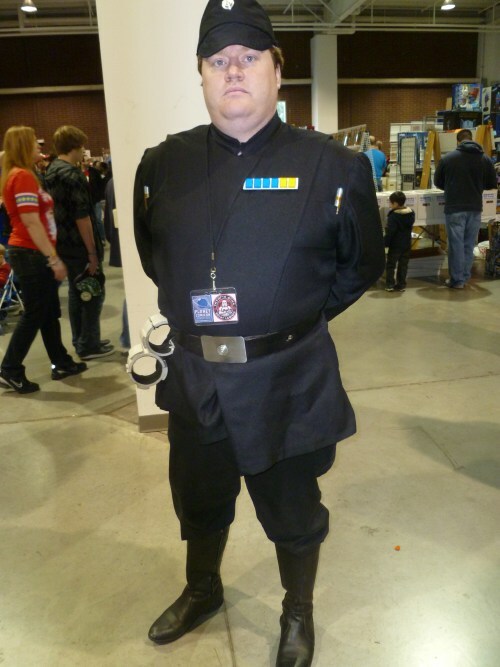 Order was maintained at all times by a stiff imperial presence. But even among the imperial officer corps, love can bloom. 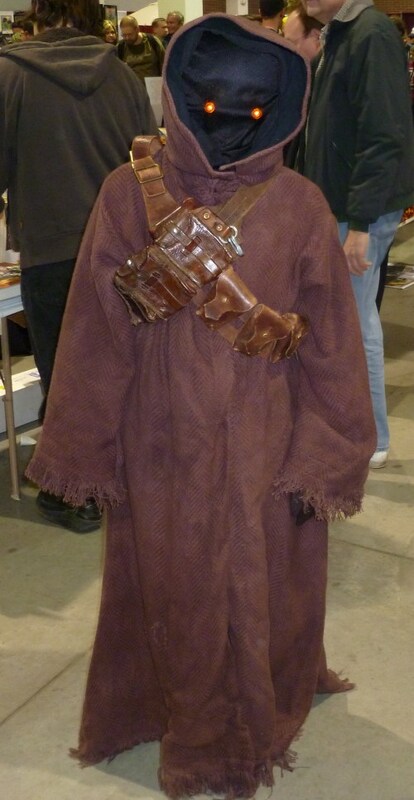 But there were people of many species, shapes and sizes, like this little jawa. When I asked to take their picture, this young padawn was with her friend jawa, but she stepped away and then got all bashful when I said I wanted her picture too. Shes in the big leagues now with those jedi robes. This strange tusken raider turned jedi also claims to once have been an emperor of the galaxy, but Im not so sure about that. 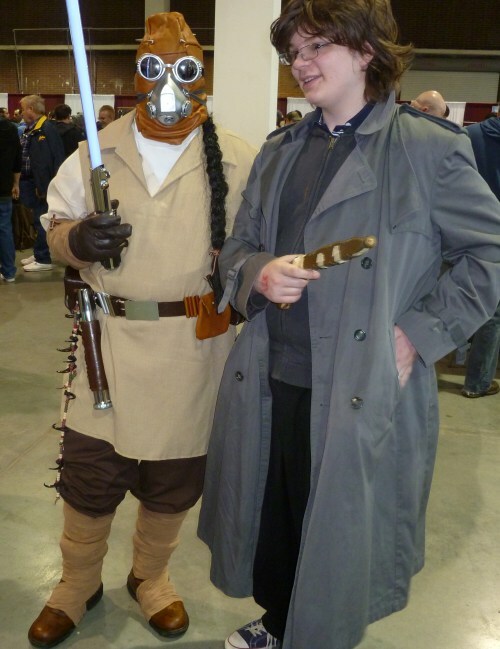 Next to him stands my son, dressed as Alexander Anderson. 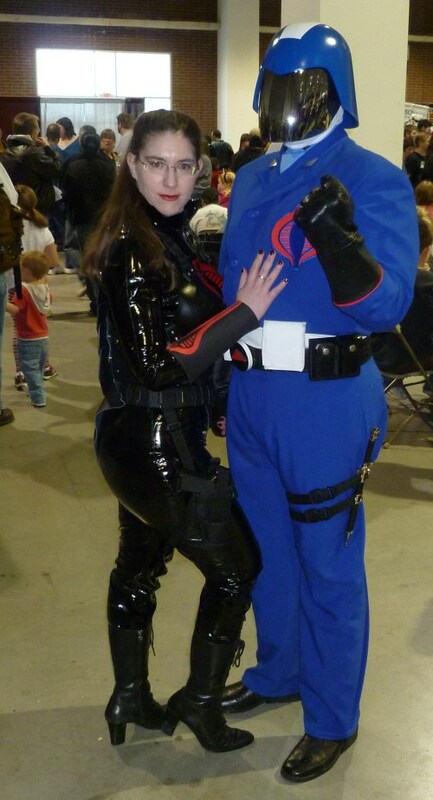 I always suspected Scarlet and Cobra Commander had a thing – the whole sinister plot to take over the world was merely the by-product of their tempestuous relationship. 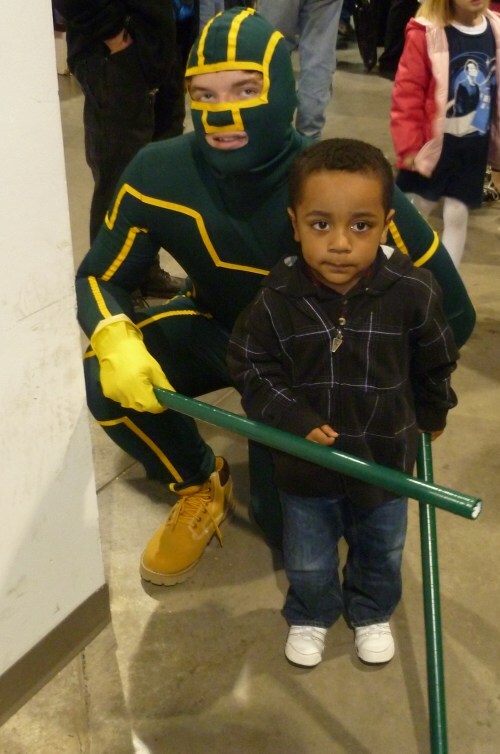 I had to ask the father if I could take a picture of his kid with Kickass, it just looked so hilarious The kid was pretty doubtful of the whole situation. 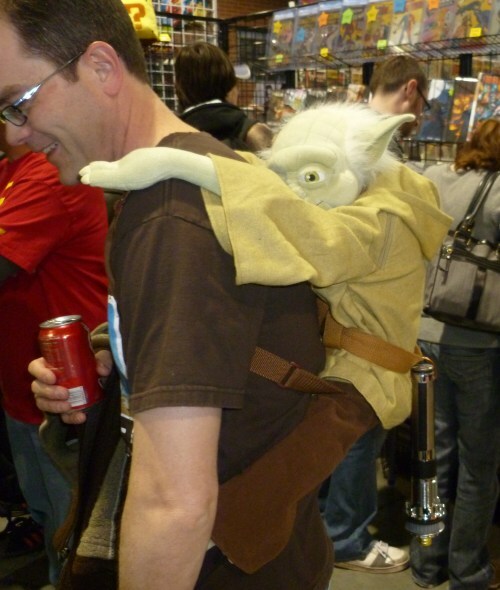 Does this guy know he’s got a yoda on his back? Yoda, what are you doing back there? And of course I must show off all the amazing plunder. There was a ton of great stuff to be found. I spent way too much money, but every seller was willing to cut a good deal. No offer we proposed all day was turned down, for the merchandise. For the artists, and there were a huge amount of artists of all types present, I never bartered. Shown are one of the two auographed Walking Dead prints, which were wildly popular this year, I was happy to see. If I were richer, I would have bought a lot more artist stuff than I did, and at first I was sad, because I wasnt able to buy something from them all, but I found that just talking to them, and commenting on their work was also rewarding. I cant buy your stuff but hey I can tell you how much I like it! Most of the artists seemed happy to talk about how great their work was, and after awhile, I realized we were a just a bunch of nerds hanging out with the stuff we loved. I totally support the many talented artists, and it is good to see that there is a place for them to flourish. 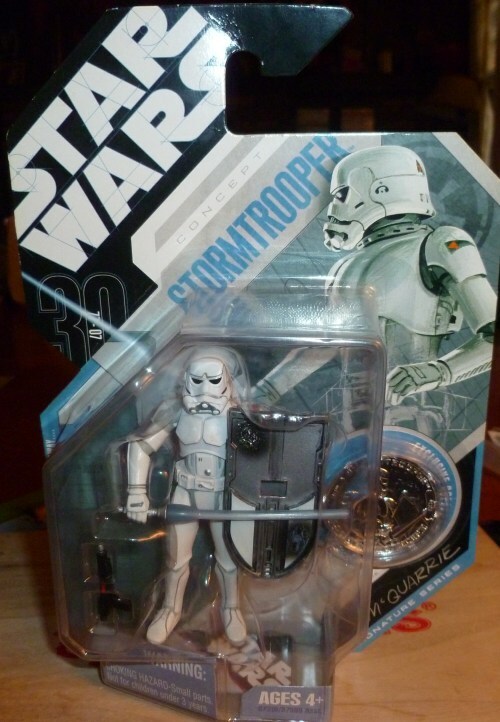 Accidentally left out of my loot photo was the single biggest find of the day, the elusive McQuarrie concept stormtrooper. I have been searching for this for years without luck – until now. 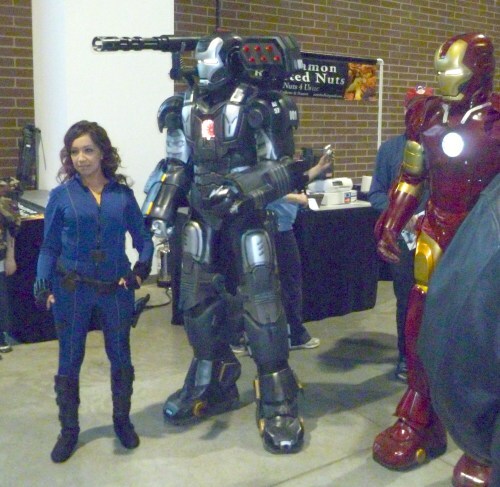 I mean, come on, its a stormtrooper – with a shield and lightsaber! The night was dark, the moon was out, the snow was cold and white, and over it all was an evil red-orange glow of flames licking skyward as Inverness burned. Between the broken walls, the heroes could see their countrymen fighting against the ghosts who set the fires. Near the main gates a large contingent of townsfolk battled against the deathless foe. They knew they had to get in there and save as many as they could. They merely had to cross the open fields surrounding the town, but ghostly soldiers patrolled the perimeter. The mage went first, stealthily dashing from shrub to shrub. At one point he threw himself behind a bush just as a phantom soldier strode by, apparently oblivious to the wizard holding his breath a few feet away. The thief went next, showing Jarren how its done. He made it ¾ of the way across, but somehow, one of the phantom soldiers seemed to come out of nowhere, and Erimikos stood stock still as the phantom passed. The cleric Valleygirl decided to use her wits rather than her physical skills, and watched the soldiers, noticing they marched in a set pattern. She waited until they were at their furthest away and hurried across the field, robes swishing. She came to a stop just below the banks of the main road leading to the gates. She gave Fargrim the dwarf a thumbs up, and he dashed across the field, throwing a plume of snow like a snow-blower. He felt a cold feeling as he passed directly through a phantom soldier. It did not hinder him, but after he was past, Fargrim glanced back to see the phantom soldier turn and emit a silent scream towards the town wall. A ghost on the wall returned the signal. Eventually they made it up the incline to link up with Malgram who was escorting a group of civilians as they made a fighting retreat out of the burning city. He looked haggard and worn out, but said that there was another group inside, led by Faldyra, and that the party should try and save her if they could. They could. 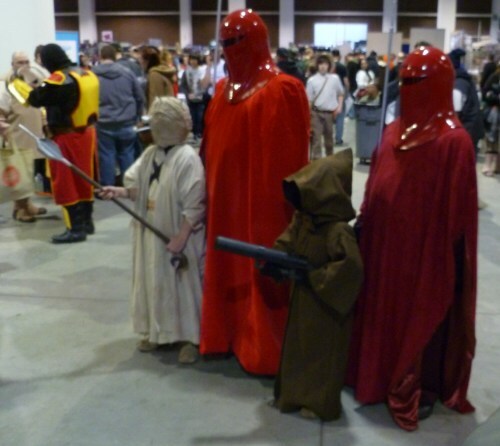 The heroes entered the city to do battle with the phantom menace. 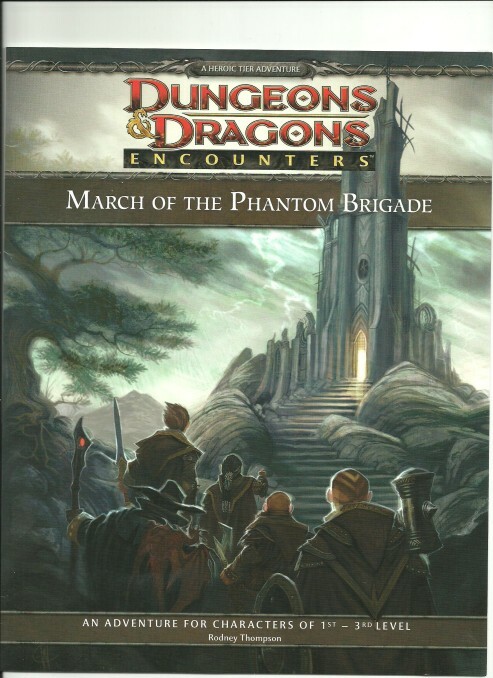 Sneaking between two homes, the party ran square into a patrol of 9 phantom soldier. They were like the soldiers they fought in the woods, 6 halbardiers, an armiger captain, and with them were a pair of ghostly soldiers wielding huge headed hammers. The soldiers had the drop on them and they were able to swarm forward blocking the characters in the narrow alleyway. The armiger then strode in swinging his pole arm in wide arcs, striking nearly all of the party but for the wizard who was slinking around the back corner of the house. The dwarf Fargrim was in the lead position, and he took a hammering (literally) from the soldiers who swarmed around him. For the majority of the battle he faced two or more opponents, but his resilience and dwarven nature saw him through the ordeal. His axe chopped and hewed with abandon. Behind the dwarf the battle cleric Valleygirl swung her mace. The armigers attack knocked her down and a soldier stabbed into her with his shortsword, taking her within an inch of her life. With the cleric down, the party would be doomed, so she did what all clerics know she must – take care of herself first, which she did. Getting up, dusting off, and healing her wounds, she began a wild series of mace swings, javelin throws, and undead disrupting that fended off the enemy and dropped a few. Erimikos was in his element, shifting and stabbing for massive damage. Only th i8nsubstantial qualities of the ghosts kept his dagger from flaying them. He shifted forward to aid the dwarf, then shifted back to aid the wizard. Jarren meanwhile was casting arc lightning and magic missile with abandon. His magic took out the majority of soldiers until one of the two ghost-hammerers saw how effective the wizard was and had a trick of his own. Unlike the heroes of flesh, the phantoms could pass through walls, and an armiger did so, coming up right in front of Jarren, forcing him to cast while in the ghosts face. He still managed to get a major hit on the ghost, buts its retaliatory strike bloodied the cloth-wearing wizard. Thinking quick, the wizard noticed a door next to him, and trying it, found it was unlocked. He shifted into the house, realized it was his own home, and sat down for a spot of tea and crackers let half-eaten on the table. He was wounded but alive, and one more magic missile sent the offending ghost-hammerer spiraling into the underworld. Meanwhile Erimikus shifted back forward to contend with the main party, leaving the wizard with the hammerer. The rogue ran out into the courtyard and threw a dagger at the other hammerer, drawing his ire. The hammerer dropped the cleric with a well-cast hammer, and the dwarf roared his rage and charged. Then the wizard poked his nose out of his house, noticed the fight was still on, and flicked a magic missile at the last standing ghost, dropping him. The dwarf rushed over and used his surprisingly good healing skills to patch up the cleric. 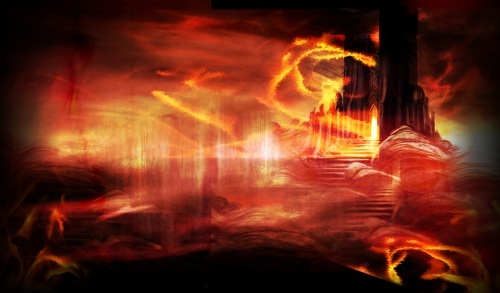 Erimikus was recovering at the edge of the battlefield, and noticed one nearby burning building. In the building was a suit of armour that was not burning like the house, and the thief risked it all to nab the delvers leather +1. A while back I was the lucky beneficiary of a friends box of unpainted minis, stowed away in a closet since the very early 90s. 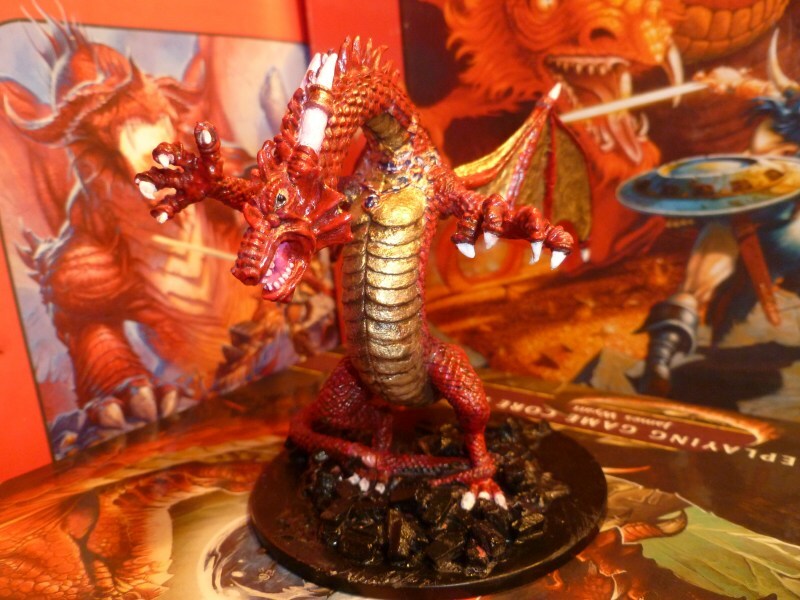 Beside some utterly cool PC miniatures, the big prizes in the collection were a pair of Ral Partha dragons. 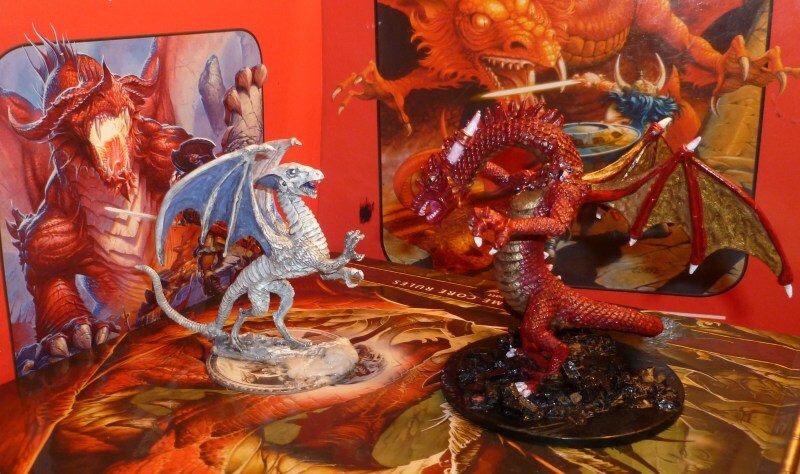 One was the White Dragon, showed off here, and the other was this huge red, from the age of dragons campaign setting. These dragons were known for having unique looks and lots of personality, since they were meant to be player characters. This miniature is dripping with character, from its glaring expression, grasping claws, and upright position, the malevolence of the dragon is palpable. Here we see it as I got it – partially painted but apart, with some built-up glue buttresses that needed to be removed. 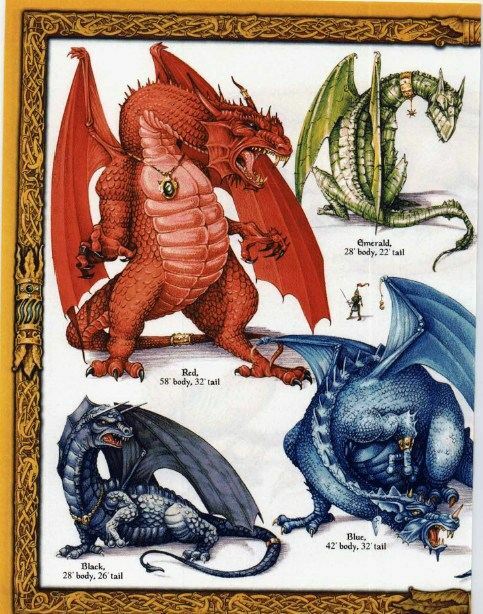 I actually had no idea it was a red dragon, and it wasn’t until I did some research that I found out which particular campaign the sculpt recalled – being atypical in its horn and facial formations. Seeing it apart, I was worried the dragon might look strange, sort of like a giant dragon-man, and those huge horny claws – just wow! But my concerns were completely unfounded, as we will see once it is together. I briefly mentioned my gluing techniques in my article on the white dragon, but to sum it up, I use gorilla glue for most gluing, often with a tiny dot of superglue to hold it in place while the gorilla glue hardens. 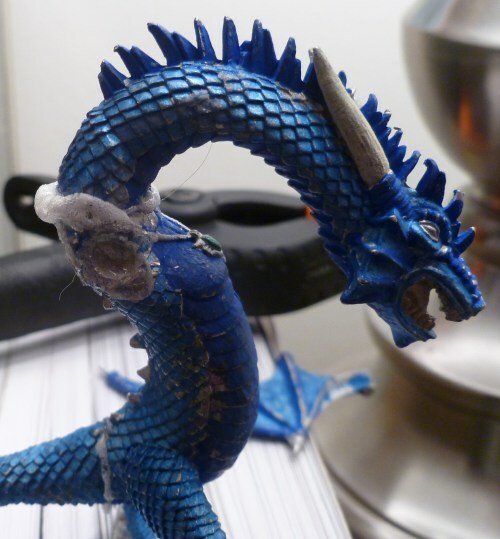 This dragon is an especially difficult challenge for gluing, as it comes in 7 separate pieces. The gluing process took all of a week to complete, because I made sure one section was FULLY dry before starting on a new section. Word of advice – patience leads to success, try to hurry the process along and I can guarantee there will be issues. On my first night gluing I had both arms together and foolishly decided to push my luck and add the wings – it would have saved me two days! Instead it cost me a day when I knocked off the arms trying to position the wings and had to let it ALL dry, then scrape the glue of and start over the next day. Trust me, do a small bit and move on until it is dry. Because of the nearness of the wings to the arms and neck, it is important to clean each area of excess glue before starting on the next section. Gorilla glue has a tendency to expand in big bubbles as it dries, but I have found a brand new blade in an X-acto knife is perfect for cleaning up this and any other flash. It is important to keep the blade new and sharp and replace often, as dull blades do not cut or clean as well, and can lead to accidents. You don’t want to put any more pressure on these seams than you have to, so be careful while cleaning up the excess glue. This will expose open areas and gaps that need to be filled, I use a tube of the stuff that looks like model cement in the model aisle, contour putty I believe it is called. Once the model was completed, I attached it to a huge base I happened to have thanks to the 43 thousand fey crocodiles I have out of the latest miniatures set – blue dragon, hydra, and catapult will be mine if it takes 43 thousand MORE crocodiles to get! Last time I was using a large base, but these fey crocs are easy to cut off their bases and for such a big, heavy miniature, the stability of a huge plastic base is worth the cost of a trashed huge. Then I added some “rubble” from my WW2 diorama supplies – bricks and broken rocks to make it look like the dragon might be standing on a collapsed wall, and painted it all black. I was originally going to go over the rubble with grey, but for now decided to leave it black. Maybe Ydraiggoch lairs in a coal mine, I don’t know! Has there ever been a pink dragon? Then it was time to prime, and I chose fuschia. 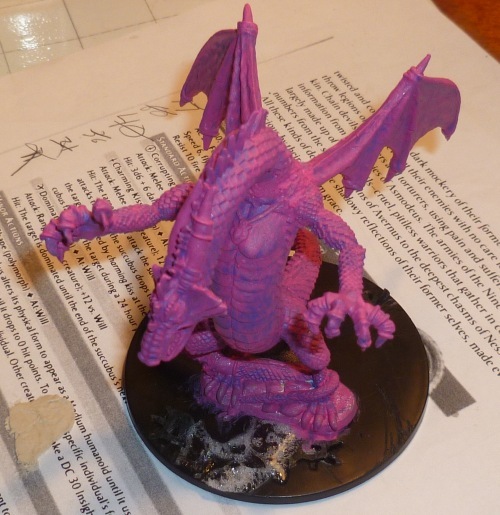 Part of me wanted to call it quits after the prime coat – that is one swank looking pink dragon. I used a different method of painting this time, I call it the Layer Method. No washes or drybrushing this time, I simply start with the lowest darkest colors first and work my way up to lighter, higher colors until the whole thing is painted. For example, for the dragons golden breast, after the primer, I covered all areas that would be gold with a thin mixture raw umber. Over the umber I painted classic rich gold, a little thicker mix than the umber, and in the corners, and against the edges, I left some umber showing. This is sort of the reverse of doing a wash. Instead of doing a wash after the main coat, I pre-darken the areas with an under-coat. The result is that the main colors are more vibrant in the end. Finally, I took my lighter titanium gold and lightly touched the raised portions and forward edges, highlighting. For a red dragon, I wanted to keep the vibrancy. 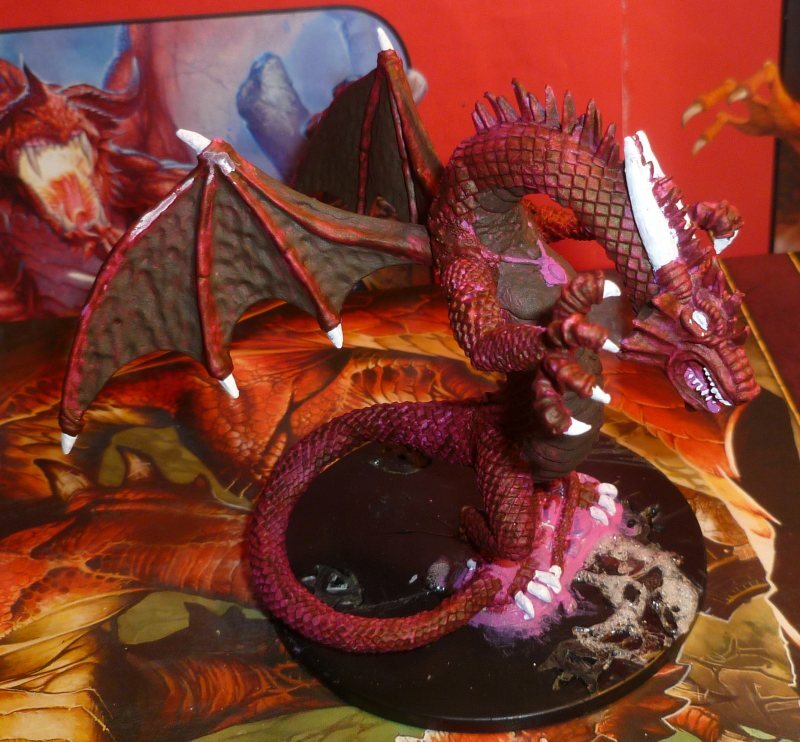 I used a dark red for the under-layer of the dragon, and cherry red on top. For his jewelry, I used copper since I was already using a bunch of gold. 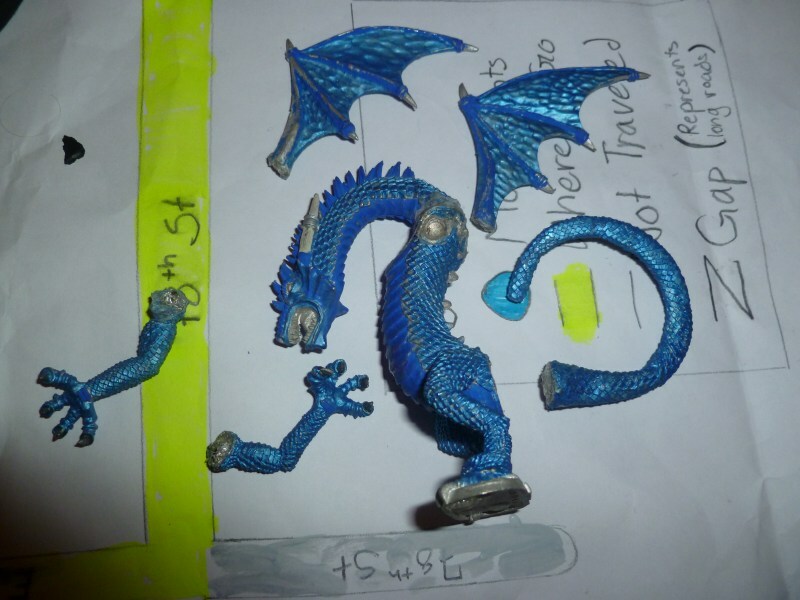 I added a choker to the dragon to hide the glue line around his neck, and added the blue gems to the jewelry to help set it off. His claws and horns I did in white, and only his tongue I left in the original fuchsia primer. 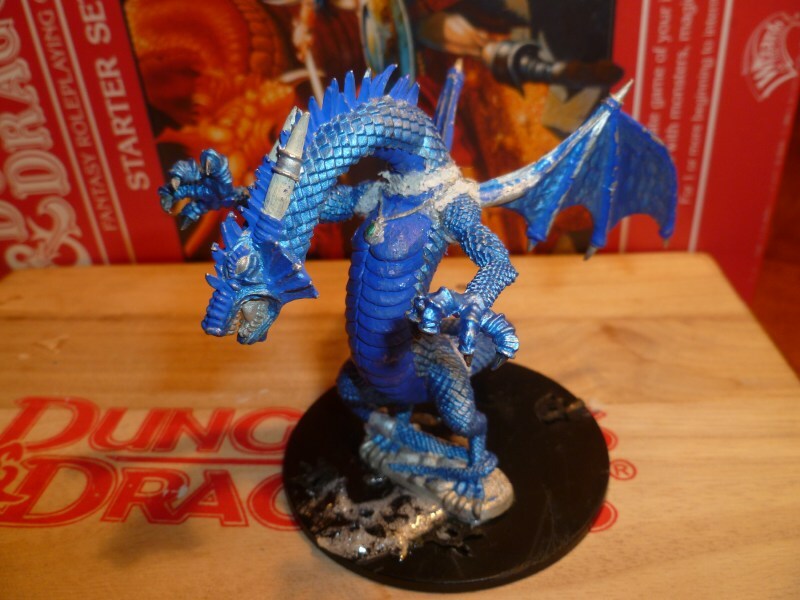 This dragon was a great joy to build and paint. The gluing was difficult, and not without its problems, but it can be overcome with patience and gorilla glue. I think I have improved with this dragon and have become somewhat addicted to building and painting dragons.I may need to go online and find another for my next project. I am not sure of the status of Ral Partha, but I have heard some mighty good things about Reaper minis. Continuing the annual tradition of bringing Irish legend into our St Patricks game session, this time around we delved back further into the Irish myths and legends of their age of heroes. The main characters of our story had just saved the three children of wizard Obitello Amber, Xvart, Ismelda, and Isolda from the hellish fate of the devil infestation in the dungeons beneath Chateau Amber. The completion of the quest required a few days of rest while the enchanter repaid them in magical enchantments to their arms and armour. One afternoon on the tropical Isle it began to snow. Since the isle was connected to the feywild this was not as unusual as it might seem, but when the death-cattle Camus the catoblepas made an appearance they knew something was up. Camus told them it was Beltaine eve, a magical time in the feywild when many return home for days of revelry. Camus reminded them to stay true to their friends, and also told them cryptically, of the tradition to drive cattle between two bonfires to purify and pacify them. Soon after the death cattle left, the baying of hounds was heard, then the thunder of the chariots and the squeal of their wooden axles as 4 giant chariots hove into view. One was pulled by a massive white six legged stallion, and from it jumped a smiling elf of giant size. He introduced himself as Finn MacCool, chief of the fionna, or bandit gang. Next stepped out a regally robed and bearded man who rode a chariot pulled by a great wolf. He was Amergin Ghostraven the bard and boon companion of Finn. Old King Conchobar Hounder was pulled by a giant sure footed goat, and lastly, young Angus the Bear, whose wild golden curls and over-powering musk led all the ladies to swoon for him. His chariot was pulled by a great bear of course, a second or third cousin of the primal bear-druid. They announced Xvart had been chosen to go on the Wild Hunt, and that the heroes may accompany them if they chose. (Aside: a side quest was that Obitello hoped they might recover the philosphers crown) Luckily they (grudgingly) agreed to go! They first must divide into two teams of three and each team chose their chariot. 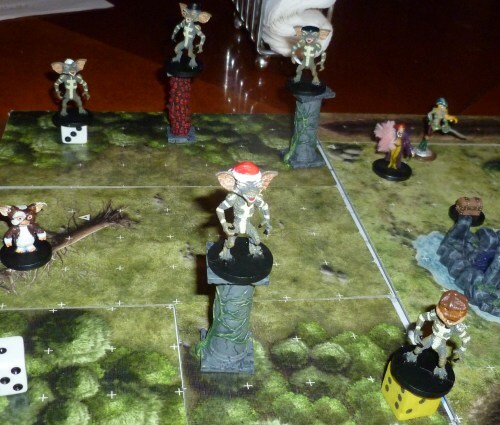 Poppy, Ria and Hex chose the sure-footed goar, while Sharia, Thokk, and Felipe chose the bear. One acted as driver, one acted as navigator, and the other was the animal handler. Soon they were off and the snow became steady and the temerature dropped. They crossed the lake, then pssed through the bog and were soon into deep dark woods. Finn pulled close and pointed ahead to a star formation. 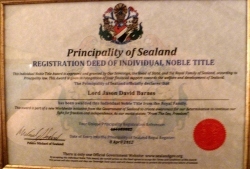 “That be the ladies crown. 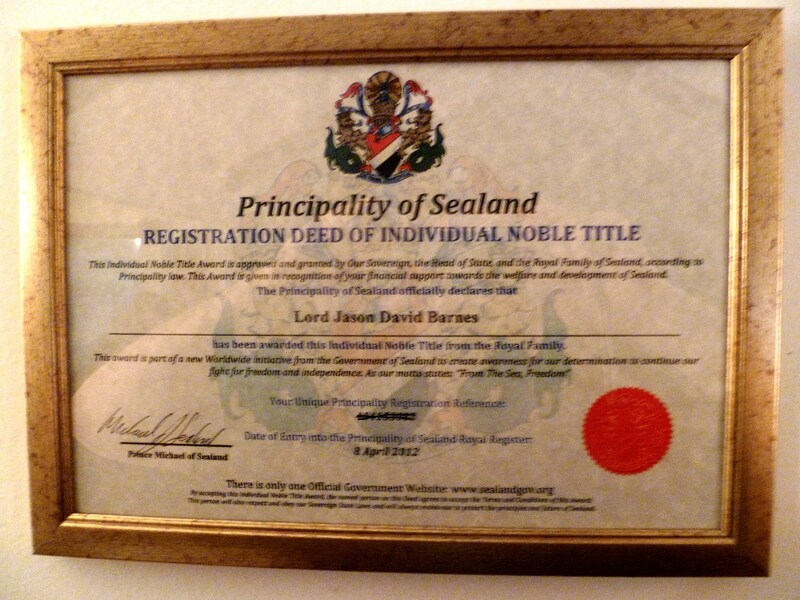 We go to me cousing Queen Medb who resides at Tara! It lies just below the green jewel thar in the crown! We’ll race to the finish if you’ve the stomcah for it!” He whooped and Finn threw a spear into the wheels of one chariot while old King Conchobar fouled the other chariot. They sped away while the heroes chariots spun to a stop. So began a race over a river, through woods, they had to jump a ravine and at one point Amergin cast a lightning bolt that opened upo a ravine before them. The chariots wheeled and careened and then the second chariot pulled forward, even with Finn as they came to the straightaway, with the tall hill of Tara looming up before them. It was deemed a tie but Finn MacCool handed out solme gifts for the great run. When they dismounted before Queen Mebd and her ward young Brigid, Xvart and the maiden exchanged glances and fell instantly in love. When they found a moment together she gave him her ring, but told him to hide it. Meanwhile it was time for the salmon catch at the stream and everyone was invited. 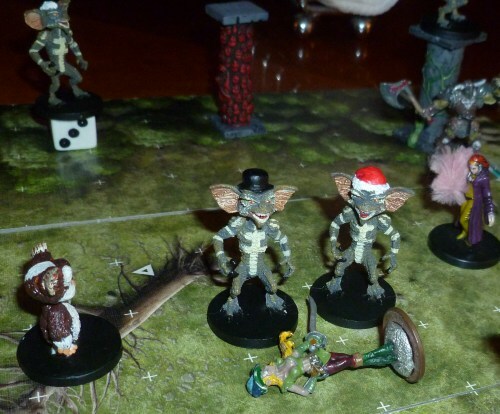 As they were getting ready to dive into the water, stripping themselves of excess clothing, one of the PCs noticed old King Conchobar standing near Xvarts clothing, and with his big toe, he flipped open Xvarts purple vest and out rolled Brigids promise ring. Conchobar flicked the ring into the stream with hiss toe and the most amazing thing happened. A salmon leapt out of the water, likely to catch the jeweled fly, and instead swallowed the ring. The PCs finally managed to catch the ring, and that night, Finn MacCool announced he would take her as his wife as she had come of age on Beltaine and had no promised love. Eventually Felipe returned the ring to Xvart and the two were able to be together, but Finn MacCool was angry and felt betrayed. Brigid gave Felipe another of her rings as they left to continue their hunt. They had to cross a ford, and at the ford a strong but young warrior named Cuchulainn stopped them and would not let them pass until he was defeated. Poppy tried but was vanquished at first blood, but Thokk finished the deed. Now they were lead into small boxed in coanyon, snow and ice covered, where Donn Culaingne, a death cattle much like Camus the catoblepas, though smaller, waited near a pair of bonfires. He agreed to side with the party against the giant elves who were preparing to attack. The fight was long but intense, as the heroes fought against the four giant elves, and the four chariot mounts who transformed into 4 huge hounds. When Finn was slain, the catoblepas Donn Culaigne decided tostrikle out on his own and be owned by no man, he also betrayed the party by attacking first Poppy then Hex, but Hex drove the cattle back through the bonfires, pacifying the cattle. Felipe went down under the attack of the hounds as she stood at the entrance to the canyon and would not let them pass. Finn went down, then Angus went down, then a hound or two, and eventually old King Conchobar called a retreat with him and Amergin and the surviving hound even as the snow and ice began to melt and the sun rose on the dawn after Beltaine. Strange night indeed. Aldus Splintershield, wounded from his run in with “the 13th axeman” sent Malgram and his team of searchers back towards town, while he joined our party of heroes, made up of Quinn the knight, Jarren the wizard, and a new recruit Brandis the paladin. Together with Brother Splintershields urging, they went exploring northwards into a valley where it looked like the disease may have originated. The bright moon shone down on the white snows of the winter valley, making the shadows under the eaves of the towering trees all the more dark. The party stumbles northwards towers the steep banks of the eastern hills towards some shallow bear caves. At one such cave, they smell a horrid stench of decay, and investigating, they turn up a pair of dead bears infected with the disease. No recent tracks in or out of the caves, and the bears are undisturbed. This leads them to believe the bears contracted the disease elsewhere and brought it back to the cave with them. The party continues on northeastward, and they come to a pool. The thick ice covering the pool is broken and black water splashes against the icy edges, where red crystals have formed, keeping the break in the ice from closing. They find a campsite the woodsmen used, and find an old tin drinking cup covered in red crystals. Here is where the axemen became infected. The pool is fed by a stream, so thy follow the stream to the north until they come to a strange sight. 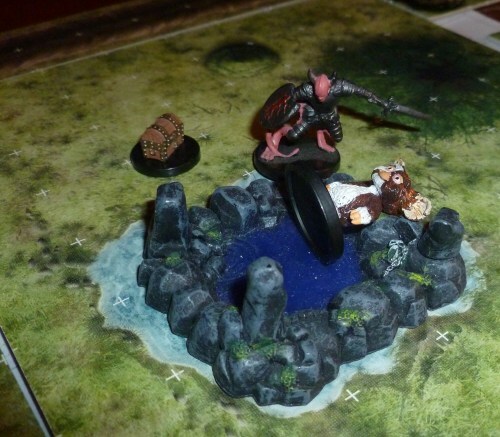 A giant boar-like demon lies dead and decaying across the stream. Long jagged crystals shoot out of him at odd angles, and he causes the stream to pool up and flow under the ice around him. Aldus rushes forward and begins his cleansing ritual to purify the infected demon and hopefully wipe out the worrisome crystal plague. Just as he finishes the ritual, there is a flash and the divine white glow is replaced by a sickly green light, and out of the flash, a number of ghostly warriors step forward. They wear armour of ages past, and look like a troop of soldiers. 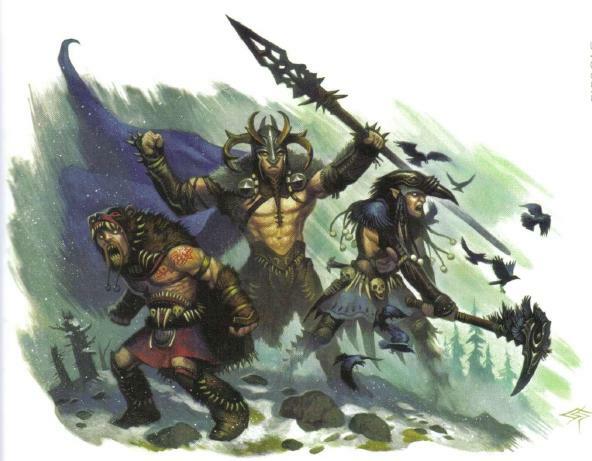 Two leaders surround Alsud, stabbing him with their long pole-arms (glaives) while six swordsmen create a protective picket-line to keep the rest of the party from helping the poor dwarf founding father. Reacting quickly, the knight and paladin, shoulder to shoulder charge into the ghostly soldiers lines. Each took out a phantom warrior, who exploded into whisps of shadow when they fell. If a warrior was next to a fallen comrade, he would take in some of the shadowy essence of the dying phantom, becoming stronger for it. 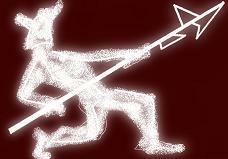 The wizard began throwing his arc lightning, frying up the phantom warriors 2 by 2. Meanwhile, Aldus staggered under the blow of a phantom captains glaive. The blade cut through the dwarfs leather armour, spilling his blood over the red snow, and Aldus went up on his toes with the force of the uppercut. The other phantom captain ignored the party to take a swing at the town founder as well. 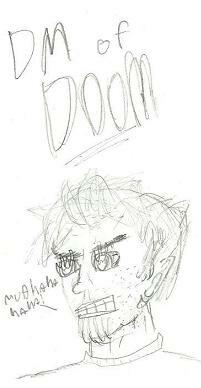 Aldus went down under the attack, and the rest of the party was unable to get to him. As Aldus creid out and fell to the snow, knocked unconscious by the blow, the heroes saw a bright flash of light in the sky. Not from the attack, the brightness came from behind them, from the direction of town. This was bad. Time seemed to slow down, and silence filled the night, broken only by the singing blades, the grunts of bodies pressed far beyond their strength. The two phantom captains cackled as the knight, paladin, and wizard hacked through the remaining phantom minions. One of the ghost-leaders took his glaive and dropped it over the dwarfs neck, and with his foot stomped downwards. Aldus’ head rolled free in a spreading field of red. The demonic shadowy ghost warrior looked ot his comrade. The deed is done, they be our reward!” So saying, the second captain strode forward and sung his glaive wide, striking all three heroes as the glaive spun in a complete circle around the whirling warrior. Soon the second captain joined the first, and both warriors gritted their teeth as they faced the dueling glaives. Quinn was knocked down and back, while Brandis stood firm and got cut to ribbons. Launching himself to his feet, Quinn tossed the paladin his sole healing potion and struck the first captain a mighty blow, bloodying him. Brandis took him in the chest, and the captain exploded into shadowy tendrils as he screamed his last. In pure rage, Quinn struck the head off the second captain, and even as his bloody sword swung free of the ghosts insubstantial neck, his eye caught upon something shiny on the dead dwarfs body. He bent to investigate and found that the Aldus was actually wearing Dwarven Armor +1, which Quinn knew the dwarf wouold want to see go to good use, along with the 75 gold in his pouch. Behind them lay their home, threatened by loss of the cleansing ritual which died with their founding father, the dwarven priest Aldus Splintershield.